Four dailies and four weekly titles are to do battle for the title Midlands Newspaper of the Year as the shortlist for this year’s Midlands Media Awards was unveiled. 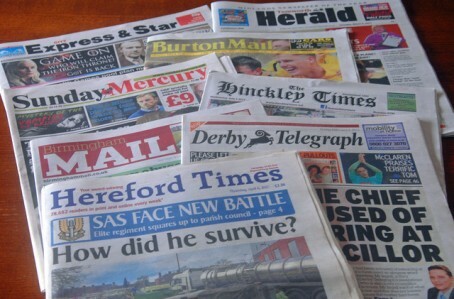 The Birmingham Mail, Express and Star, Derby Telegraph and Burton Mail will go up against the Hereford Times, Hinckley Times, Sunday Mercury and Tamworth Herald for the prize. The Newspaper of the Year finalists are pictured below. Newcomer of the Year proved the most hotly-contested category in this year’s awards, with 26 entries received from media students and trainee journalists. However, only two journalists were shortlisted for the Business Journalist award – with the judges saying that they were “surprised that many entrants regarded re-hashed press releases” as being worthy of entry. Altogether, just over 200 entries were submitted for the awards from across the region. “At a time when journalists, nationwide, are still concerned over redundancies and title closures, it is encouraging to note that the awards still have as much appeal as ever,” said Llewela Bailey, chairman of Birmingham Press Club, which has been organising the Midlands Media Awards for the past 15 years. Birmingham Mail’s Pay for Hospice’s Christmas Day. More nominations equals more event tickets sold!